Henri Alfred Auguste Dubois was born in Rome, Italy in 1859, he was the son of the medallist Alphée Dubois. He was pupil to his father, to Chapu and to Falguière. In 1878 Dubois competed for the Prix de Rome for which he received a second prize award. 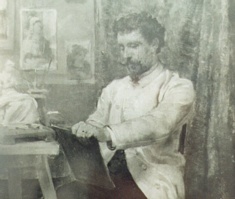 He exhibited at the Salon de Paris from 1880 to 1901, received a third-class medal in 1888, a travel grant the same year, a second-class medal in 1893 and a first-class medal in 1898. Dubois was awarded a silver medal at the Exposition Universelle in 1900 and was made a Chevalier of the Legion of Honor in 1903. His works are in the collection of the Musée Luxembourg in Paris.